It is compact, accurate, easy to use. Insert battery, push button, get yardage. It couldn’t be easier. Battery life is long. The battery life is almost a whole golf seasons. Leupold’s proprietary Club Selector allows you to set select GX rangefinders to your individual hitting strength. Simply enter your personal striking distances for the 8, 6, and 4 irons, and in conjuction with TGR, the GX rangefinder will then recommend the appropriate club for your hitting strength, ensuring a reliable shot to reach your intended target. The cutting-edge DNA technology propels golf laser rangefinding to new levels of precision, and speed. Get faster, more precise ranging with resolution to within 1/10th of a yard against all background colors and textures. DNA takes the groundbreaking GX series to a new level! Fully multi-coated lens system ensures maximum brightness for clarity, contrast, and color fidelity. One Touch Scan Mode (Golf): When you want multiple quick readings in one quick sweep, just hold down the power button and the display will continuously update with accurate line-of-sight distance measurements. Pin Hunter & Prism Lock : Every GX golf rangefinder has been precisely calibrated to fire a laser beam exactly at the target in the crosshairs. Whatever the course, you can be sure the results you receive from the GX are the most precise available from any golf rangefinder on the market. 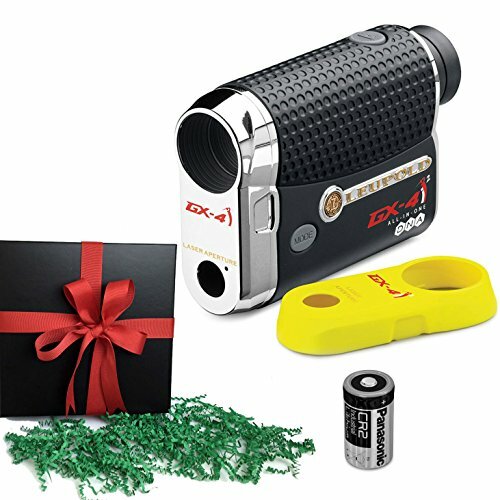 PinHunter Laser Technology (Golf) : All Leupold GX rangefinders feature Leupold’s exclusive PinHunter Laser Technology for quick and accurate distance measurements on the golf course. The PinHunter technology measures the pin instantly and clearly up to a distance of 350 yards (GX-1i, GX2i) and 450 yards (GX-3i, GX-4i). Prism Lock Technology (Golf) : Leupold’s exclusive combination of PinHunter Technology and Prism Lock capability afford unmatched flexibility on thousands of courses nationwide and internationally. Not only can you range any course feature, but the addition of Prism Lock provides instant, audible feedback and freezes the distance on the diplay when you’ve ranged the intended feature. Select from three different reticles : Offers three different reticles to choose from: Plus Point™, Duplex, and Duplex with Plus Point. True Golf Range (TGR) (Golf) : Leupold Golf rangefinders featuring True Golf Range (TGR) measure the line of sight (LOS) distance as well the incline/decline to the target. In addition, the golfer can enter the ambient temperature and the altitude (height above sea level) as these also affect the striking distance. They are the world’s only rangefinders to provide such exact distance information. Brighter, faster, more accurate: take your golf game to the next level with the Leupold GX-4i2. The high performance DNA (Digitally eNhanced Accuracy) engine provides incredibly fast measurements, and when combined with PinHunter 2 laser technology and Leupold’s exclusive Prism Lock ®, deliver unmatched accuracy on any course. Truly customizable, the removable Smart Key gives you the benefit of True Golf Range (TGR) and Club Selector, so you play the right shot every time. Rugged, compact, and completely waterproof, Leupold’s GX rangefinders are sure to shave strokes from your game and speed up your rounds. The Leupold GX-4i2 has 2 major changes in this new model. I already mentioned the new Smart Key faceplate; Yellow is non-conforming, silver is conforming. They now have more power, or more disabling power than the previous one. The other new addition is the PinHunter technology is improved. While I have been impressed by the previous PinHunter tech, the advances are impressive. The one knock on laser rangefinders, especially Leupolds has been the shaky hand. Because of the smaller size of the rangefinder and typical one-handed use, someone with shaky hands would often miss the pin or have trouble getting an accurate reading of their desired target. PinHunter2 technology is legit good. I could get really accurate readings even as I was shivering in the cold this spring. I rarely shot twice and never a 3rd time because I got a correct reading on the first shot. If there was ever a prism it beeped instantly. The rest of the Leupold GX-4i2 hasn’t changed from previous models. The size is the same, the OLED red display are the same, the 6x mag is the same, the crystal clear optics are the same, the prism lock beep is the same and all the slope features remain the same. . Just looking at it and using it for a short time probably wouldn’t make the new features stick out, but on the course, even just one round, the PinHunter2 was very noticeable. While Leupolds Rangefinder have always been fast, this one is faster and more accurate.